Logan’s biological father has been building an army to rise against the Crown, to challenge Cyrus and Sevan for control over the vampires, and their voices will be heard: every one of them is a rightful Royal. He is not the only one who is tired of hiding in the shadows. Other family members lost their lives trying to bring all vampires into the spotlight, to show the world what they are capable of. With this many descendants, with this much bad blood, this will be a war fought with enemies new and old. This is the same war the King and Queen fought over a thousand years ago. It will be a battle to the death to keep the vampires’ secret. 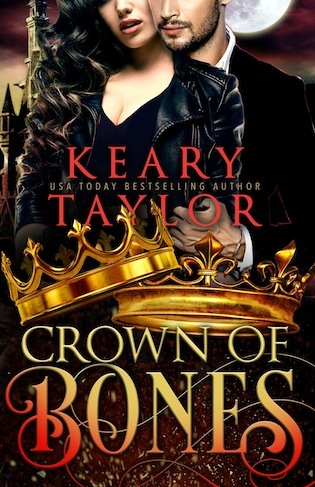 Keary Taylor is the USA TODAY bestselling author of over twenty novels. She grew up along the foothills of the Rocky Mountains where she started creating imaginary worlds and daring characters who always fell in love. She now splits her time between a tiny island in the Pacific Northwest and Utah, with her husband and their two children. She continues to have an overactive imagination that frequently keeps her up at night.